Fresh Harvest, LLC is Nashville’s first and oldest online farmer’s market, created by John Drury and Tallahassee May, two pioneers of the area’s local agriculture movement. 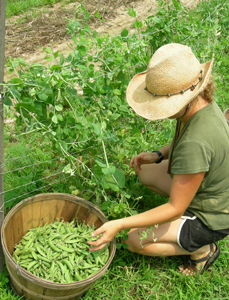 Started in 2005, the goal was to provide more vegetables and more variety to more customers, outside of the traditional CSA model. Fresh Harvest is formed by two farms, Drury Family Farm and Turnbull Creek Farm. We are both small family farms located just outside of Nashville. Together, we have over twenty years of growing experience. We pride ourselves on producing a bountiful selection of fruits and vegetables picked at the peak of flavor and nutrition. We also love to grow flowers. By joining our farms together and working cooperatively, we are able to offer you a large variety of produce and flowers of consistently high quality. Our subscription service offers you fresh, local produce and flowers grown without chemicals. Our season is a year round service. Every Sunday evening, we email you our selection of available fruits, vegetables, and flowers, along with prices. You have until Tuesday night to place your order for a Wednesday delivery. You only order what you like, in the amounts that suit your needs, and you are not obligated to order every week. On Wednesday afternoons, you pick up your order at Trinity Presbyterian Church on Hillsboro Rd. in Green Hills. Pick ups are also available at our farms in Bon Aqua & Thompson’s Station. We guarantee that nothing could be fresher, healthier, or more delicious than our produce and flowers. To receive our emails, sign up on the “Your Account” page. A deposit of $50.00 is also requested before you place your first order. Your deposit works as credit for your account, and your orders will be deducted from that. Available credit is noted on your weekly invoice, and another deposit is required once the balance is depleted. You can place your deposit in your account via Pay Pal on the “Your Account” page, send in a check, or when you pick up your order. We have available to you a huge variety of crops which change throughout the season. Since everything we sell is locally grown, our offerings vary with the heat, the rain, the insects, and other unforeseeable circumstances. We plant successive plantings of the most important crops for a steady supply, and typically any shortages are offset by the abundance of another crop. We do sell produce and products from other farms. These farmers are small, local, family operations. Almost all of them (except the meat and egg vendors) we first met while selling at the Franklin Farmer’s Market more than 10 years ago. These are growers and providers we absolutely respect and trust, and are proud to represent through Fresh Harvest. 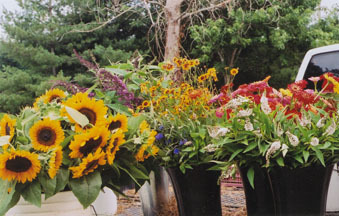 Each week, you will be choosing from a delicious selection of heirloom and specialty varieties of vegetables and flowers. These include lettuce, salad mix, arugula, spinach, Asian greens, kale, Swiss chard, broccoli, tomatoes, cherry tomatoes, edamame, melons, green beans, eggplant, summer squashes, winter squashes, carrots, beets, sugar snap peas, cauliflower, fennel, sweet and hot peppers, potatoes, cucumbers, fresh herbs, corn, and okra! We also grow dozens of beautiful cut flowers. Ask for a bouquet of whatever is fresh every week! Why Buy from Fresh Harvest, LLC? When you buy directly from Fresh Harvest, you are buying directly from the farmers that grew your food. There is no middleman or hidden costs. Your food is fresher, healthier, and better tasting than anything you can get in a store, and you are supporting local, sustainable agriculture! We are small farms, and we offer you personalized service. Everything you buy from us is picked to order, meaning that your food comes right from our fields to your table. We guarantee your satisfaction with our produce!